Kris Patterson added to his slim American Late Model Series points lead by winning his second late model feature in a row at Oakshade Raceway Saturday night. Fifty-four late models filled the pits for the first of four ALMS events this year at Oakshade Raceway with Kris Patterson coming into the night just 3 points ahead of Jeep Van Wormer. The red flag flew before a single lap could be scored in the 30-lap ALMS feature after a huge pile up in turn two completely blocked the track. Among the cars caught up in the wreck were those of Hillard Miller, Rick Delong, Jeep Van Wormer, Justin Paxton and Greg Martin. Van Wormer and Martin were both finished for the night. Miller and Paxton made quick repairs and returned before the restart and Delong rejoined the race later many laps down. Once racing resumed, Patterson found himself out front with a large lead over Aaron Scott and Brian Ruhlman. Ruhlman took over the second position on lap 24 and began to eliminate Patterson’s lead in the final stages of the race. Ruhlman closed right in on the back bumper of Patterson with a couple laps to go and on the final lap; Ruhlman drove hard into turn three under Patterson to take the lead momentarily, but Ruhlman slipped up the racetrack and Patterson ducked back under Ruhlman coming out of turn four to take the checkered flag and $2000 for the win. Ruhlman settled for second followed by Aaron Scott, Shane Yoder and Todd Schroyer. Tim Fisher took control of the sportsman A Main early on with Ray Klaywitter all over his back bumper. Six laps into the race, Fisher’s car started smoking and a lap later he drove off to the pits turning the lead over to Klaywitter. Klaywitter went on to claim his third sportsman feature win of the year with Rob Liaeff second, Devin Shiels third, and Joe Derbek fourth. Brice Luttrell and Rob Price started on the front row in the bomber A Main and put on a pretty good battle for the lead for much of the race. At the conclusion of the race that was marred by many cautions, it was the Adrian, Michigan driver, Brice Luttrell the first to cross the line. Price finished second with Brad Miller third. Jody Burton led one lap in the bomber B Main and then drove too high into turns three and four which allowed Chuck Leininger to grab the lead and the eventual victory over Gary Cole, Bob Rendel and Josh Caudill. Danny Hogrefe rocketed to the front of the pack in the bomber C Main to claim the victory over Ben Thomas and Tim Streight Jr. 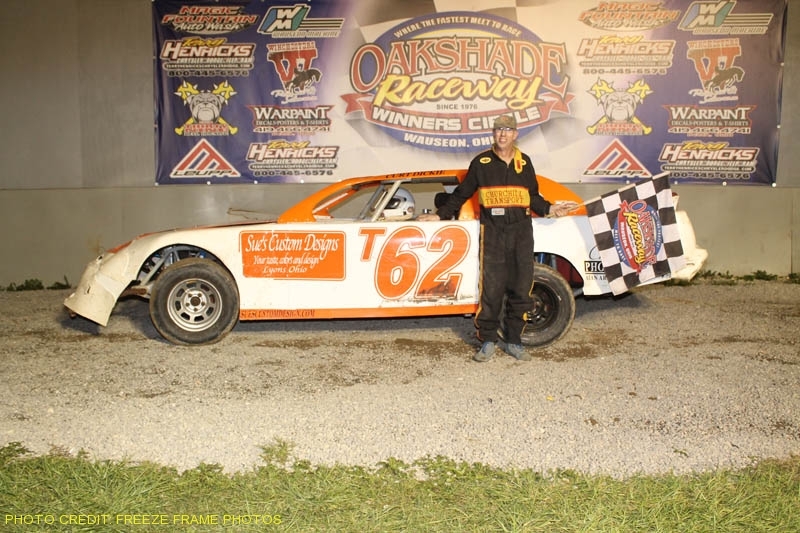 This coming Saturday will feature a regular racing program at Oakshade Raceway featuring late models, sportsman and bombers.